Following the start of our recent collaboration with Phenocell, we’re pleased to be able to provide high quality Sebocytes developed from Human induced pluripotent stem cells (iPSC). Thanks to a perfectly standardized reprogramming protocol, they display lower batch to batch variability, allowing better reproducibility and accuracy of your experimental results. toxicology and drug discovery, including 3D skin reconstruction. These cryopreserved reprogrammed pluripotent stem cells are available at low passage (P2), 2.106 cells/vial format and in 3 different phototypes (Caucasian, Asian and African). Developed from highly qualified Human iPS cells, each lot is validated, with a specific certificate of analysis, for all the following Sebocyte markers and specific functions. Phenocell’s iPS-derived human Sebocytes display the typical epithelial morphology of primary sebocytes with heterogeneity in cell size due to lipid accumulation. Phenocell Sebocytes from human induced pluripotent stem cells. 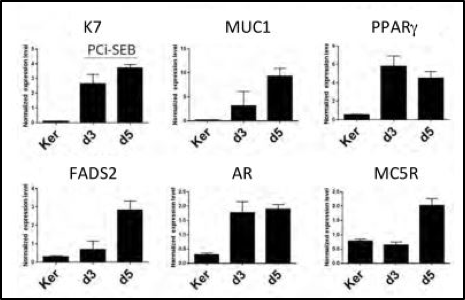 Evolution of specific markers in Sebocytes derived from Human induced pluripotent stem cells after 3 (d3) and 5 (d5) days in culture with the specific PhenoCULT©-SEB culture medium, compared to primary keratinocytes (Ker). 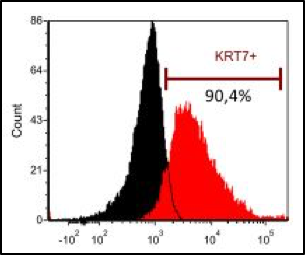 KRT7 expression shows Sebocyte purity above 90%. PCi-SEB respond to a 96hr treatment with testosterone (10 µM) by a 2-fold increase in lipid content. This response is significantly inhibited by the 5α-reductase inhibitor Finasteride (10 µM). Additional information regarding these Human iPSC-derived Sebocytes on tebu-bio’s dedicated web page. Interested in these Sebocytes developed from Human induced pluripotent stem cells ? Get in touch by leaving a comment below, I’ll be pleased to get back to you to discuss your projects and needs.